Are you trying the Keto diet? My husband and I are giving it a go and starting to experiment with things we like. 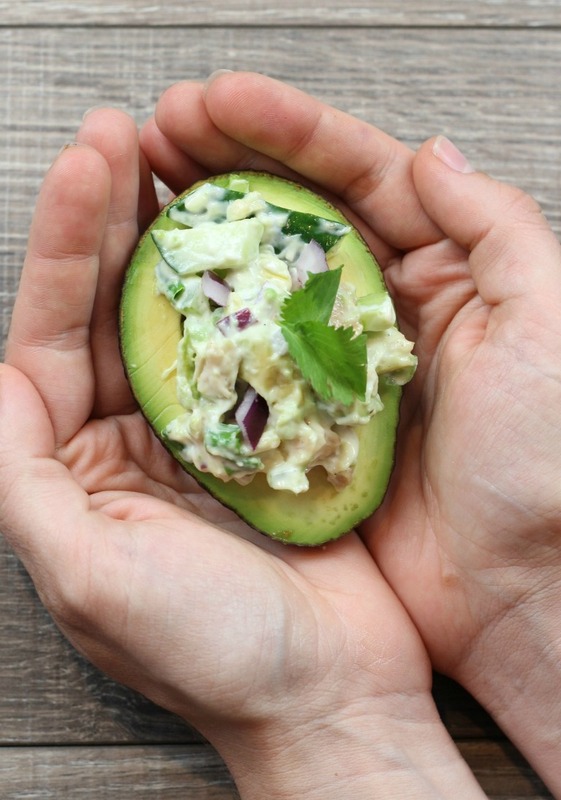 We love these Keto Chicken salad stuffed avocados because they are packed with flavor and so delicious! We featured these on my cooking show, so if you want to see them cooked live check out the video. The stuffed avocados start at the 37:33 minute mark of the video. Cook the chicken breast on low heat until fully cooked. You can do this in a slow cooker, in a pan or on the grill. Cube or shred chicken. Combine chicken, red onion, English cucumber & celery in a bowl. Cut and pit an avocado. Scoop some of the avocado and add it to the bowl. Add in the sour cream and season with salt and pepper. Toss everything well and then scoop the mix back into the avocado halves. We provide nutritional information for our recipes as a courtesy to our readers. The data is calculated using the MyFitnessPal app. We remove fiber and sugar alcohols, including erythritol, from the final carbohydrate count since they do not affect blood glucose levels in most individuals. We try to be as accurate as possible but we encourage you to calculate nutritional information on your own.